Winter can be the most beautiful time of the year at Chimney Rock. Leafless trees make for expansive views of Lake Lure and the Hickory Nut Gorge. The sky is clear; you're likely to find a quiet spot to sit and enjoy the peacefulness. You may even see a critter scamper by you in the forest. Capture that special moment or scene on your camera, enter it in our Winter Wonders Photo Contest and tell us about it. We'll use the winning entries on our website and Facebook album, and you'll win some fun prizes. Photos must be taken within the Chimney Rock section of the Park. The first-place winner will receive an overnight getaway to Hickory Nut Gorge with a stay at the Historic 1927 Lake Lure Inn & Spa, two passes to the Park, brunch for two at the Historic 1927 Lake Lure Inn & Spa and two tickets for a tour with Lake Lure Boat Tours. The contest's second-place winner will receive two passes to the Park, lunch for two at the Old Rock Cafe and two tickets for a tour with Lake Lure Boat Tours. Chimney Rock's Facebook followers will select the People's Choice Award winner. 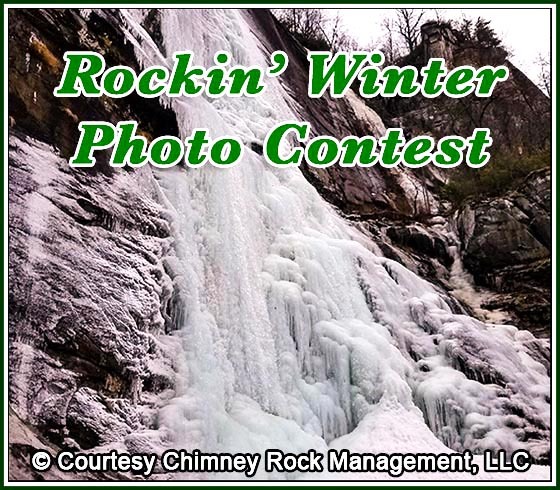 Followers will have a week to like and share their favorite photo from an album of Winter Photo Contest entries posted on the Park's Facebook page at facebook.com/chimneyrockparknc. The People's Choice Award Winner will receive two passes to the Park, lunch for two at Old Rock Cafe and their photo will be featured on the Park's Facebook page. Shutterbugs interested in capturing Mother Nature's wintry beauty can do so by entering Friday through Tuesday from 10 a.m. to 6 p.m. during the Park's winter hours. All entries must be submitted to promoandevents@chimneyrockpark.com or to the Parks' Facebook page through Facebook messenger. Winners will be notified and announced at chimneyrockpark.com and on Chimney Rock's social media channels. For more information, call 1-800-277-9611 or email us at visit@chimneyrockpark.com.